Crows are not always the most welcome sight in a rural place like West Clare, but Ailish Considine may just have changed all that. 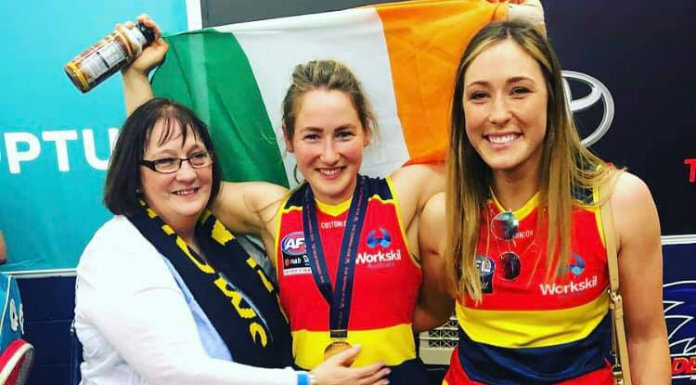 The Kilmihil native crowned an incredible journey by getting on the scoreboard as the Adelaide Crows emerged victorious in the Women’s Australian Grand Final last weekend, with Considine among the goalscorers in the 63-18 win over Carlton. It was not her first time to split the posts, with four goals to her name across a dream debut season. It has been a meteoric rise for the 26-year-old with her first taste of the sport coming when she joined up with the West Clare Waves, a women’s Australian Rules team which was set up and masterminded by fellow Kilmihil native Michael Currane. He had already built up a wealth of knowledge of the sport having spent time down under, and that experience would prove to be a crucial first step on the road to last weekend’s historic occasion. The first taste of success came when the Waves were crowned European champions after travelling to Amsterdam, and from there the opportunity to showcase her talent to scouts for the AFLW clubs was quick to come knocking. Under Currane’s guidance, Ailish was part of a travelling party of 18 who attended a Crosscoders trial camp in Australia last September and after impressing prospective employers, the Adelaide Crows won the race for her signature and from there the whirlwind began. Ailish admits she never envisaged that it would lead to playing in the Grand Final. “Coming out to start with the club in November I didn’t even expect to get a game if I am honest, and to think that I now have a Premiership medal is just an absolute fairy-tale. I have had a bit of time to reflect back on it at this stage as the week went on and it just feels like a dream. I arrived out to Australia having barely played the game and then to play eight out of the nine games during the season is just incredible. I would never have imagined or dreamed that it would have happened like that for me” she said. Considine hit the ground running from the minute she landed in Adelaide, and was handed a starting jersey for the first game of the season within weeks of arriving. She says that first experience of the professional game was a brilliant but daunting experience. 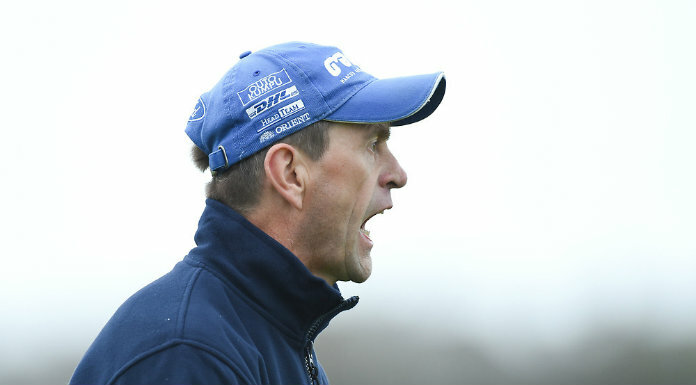 “The girls just kept telling me not to worry at the start of the selection week for the opening round and it wasn’t really until the team was announced that the reality hit. I genuinely did not think I would be in with a shot because I was so new and the level that the other girls were operating at was so high. I was so nervous because I had never experienced that process of selection week before. Once I got the nod to start, the pressure came off a little bit because the fact that I had been picked was the big part for me” she noted. The former Clare Ladies football and Clare Camogie star was not just dealing with the move to a different country and a different sport, but also a different lifestyle. The life of a professional athlete was something she also had to adjust to, but it is something she feels she got used to pretty quickly. She said: “It was definitely a big change but it is really nice to know that you can devote almost all your time to the sport that you are playing. Having that time to dedicate to honing your skills and doing all the work that is required to compete at this level is great. There’s also time then to develop your knowledge of the game and all that goes with it so that was brilliant to have too”. The fairytale finish was not without its stumbling blocks, as a review into one of her tackles in their semi-final win threatened to derail the dream. It was also threatening to derail the plans of the Considine clan to make the journey to Australia for the game as a potential suspension was looming, and Ailish says it led to a stressful few hours before the clearance came. “I got a call on the Sunday night after winning the semi-final to say they were looking at it and it was such a blow because we on such a high after qualifying. I just tried to not think about it and stay calm because I knew there was nothing I could really do about it anyway. I just had to wait until they decided if I was going to be sanctioned or not for it. It was Monday before they made a decision on it and we had to wait all day to get the news. Usually that stuff is cleared up by 1pm but it wasn’t until nearly 4pm that the call came. I went into the club and they told me that I could phone home and tell my mother Kay to book the flights over because I was cleared so that was a huge relief. I had played pretty well against Geelong in the semi-final so I didn’t really feel under pressure in terms of selection and then something that was completely out my hands could have ruined it. It was a scary few hours but thankfully it was early in the week so once it was over, it was done with and it didn’t really affect the preparations for the final” she noted. The occasion was made all the more special by the arrival en-masse of the Considine crew for the big day, with her mother Kay, sister Eimear and brother Keith all making the journey to support the youngest in the household as part of a historic attendance. She says having them there was a real boost. “It was pretty special to have them there and I actually spotted them during the game. I could see the Irish flag in the stand at one stage in the second quarter so that was a lovely moment. Knowing that they were there for it and that they were part of the occasion and the 53,000 people was brilliant. The crowd that was there for the game was just amazing. I didn’t realise how many there actually was until it flashed up on the screen. That’s pretty much capacity for the Adelaide Oval and the atmosphere was something I have never experienced before, it was insane” she said. It has been a whirlwind week for Considine with award ceremonies and club functions taking up almost all her time. She says now that the season is over, thoughts are turning to what comes next with new contracts set to be offered in the coming weeks. Ailish is hopeful that her name is on one of them. She said: “Who knows what will come next. I hadn’t thought beyond Sunday because I said to myself to just get there and then see where you go after that. This week is hectic with everything that is going on and then the re-signing period comes next so I haven’t made any plans until I know if I will be playing again next year. It will be interesting to see what the next few weeks bring and that will determine my plans I guess. Obviously I would love to be part of this group again for next season so getting another contract over here would be the ideal scenario. It also means that I am not sure about what that will mean in terms of playing football in the summer with Clare and that kind of thing. It all depends what the club out here want me to do in terms of re-signing so we will have to wait and see how all that pans out. I hope to get home at some stage if that happens and hopefully I will get to play a bit of ball back home too”. For now the focus is on celebrating the end of one historic journey while hoping it is just step one on a longer road to follow. With the Kilmihil woman showing that the path is there for others, she is urging anyone who would like to experience professional sport to grasp the opportunity with both hands. “It is definitely something you should go for if you are thinking about it. When you are playing ladies football or camogie, you want it to be at the highest level and you want it to be as professional as it can be but you are not going to get that because it is an amateur sport. It is still in the development phase in terms of getting the same as the lads do and all that. They have achieved so much out here considering they have only been running it for three years and anyone who wants to live the professional life, if you get the chance to come over, you just cannot turn it down. Another great thing about the season over here is that it runs for six months and that is all that is in it. If you love it, then hopefully you get another contract and if you hated it, you can go home again. Professional sport is what you aspire to and I would encourage anyone who gets the chance to experience that to go for it” she concluded.